Nintendo has done it again, knocking it out of the park with Splatoon 2. Available now on the Switch, it added to the short list of titles available to the console and did so in a big way. Fast paced and heart racing action, Splatoon 2 is a colorful, charming experience all the way through. The single-player is enchanting and its replayability is high. Multiplayer modes, both ranked and unranked are exciting, thrilling and weight times are extremely short. Overall Splatoon 2 was a welcomed addition to the Nintendo Switch repertoire of games. Gigamax Games took a close look at this unique shooter by Nintendo. 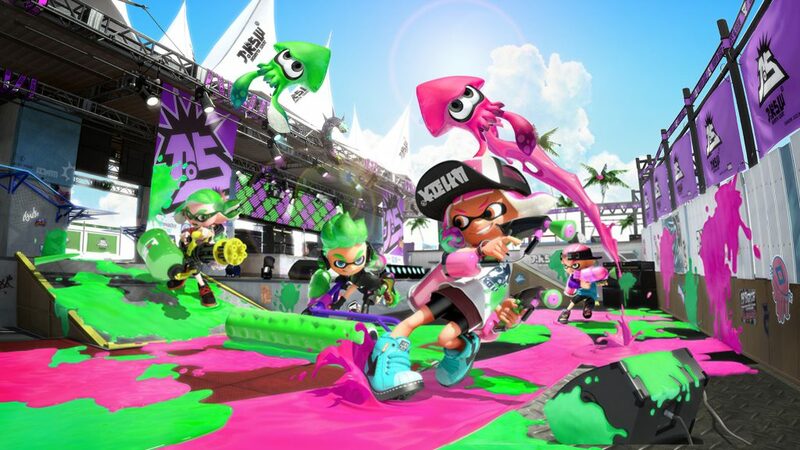 Gigs and Mack show off what really makes this game more than just another shooter, and offering pro-tips along with interesting insights about the story and lore behind Splatoon 2. Recently, Nintendo released the new I.P. ‘Arms’. Both of these latest games from Nintendo made a big splash and showed just how great of a console the Nintendo Switch will continue to be. Come take a look at ‘Arms’ in action as Gigs and Mack go head to head! Find the Splatooin 2 Playlist from Gigamax Games below! Come back here to find the latest Splatoon 2 episodes and any other updates surrounding this new release. Thank you all so much for taking the time to watch. Be sure to stay tuned for more episodes! Keep up with the latest videos from Gigamax Games, don’t forget to Subscribe, Like and Comment for more! Find the latest video game reviews, updates and developments all in one place!